Thank you for sharing your keynote with me last week. I think we were both lucky to have JB and Greg providing questions, insight and context. I want to pick up on one aspect of the talk. The use of purposeful instead of value. I understand that the general understanding of value cannot help your studies much, but I think the more rigorous definition will be useful to you. It is the rock that Real Options was built upon. Here is the definition of value from finance. 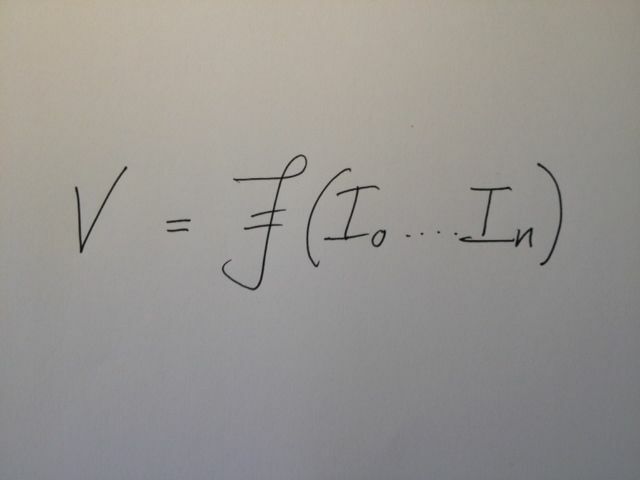 This simple and elegant formula (definition) tells us that Value ( V ) is a Filtration ( Backwards F thing ) on an Information Set Io to In. You will note that it has no units. The units can be financial such as US Dollars or Scottish Pesos ( Had to make it topical ). Currency is useful as a means of exchange. As a means of transferring something from one entity and another. The units could also be something internal like the “Jabey”. The “Jabey” is an internal currency that is never articulated. The “Jabey” is not used to exchange things between entities. We use the Jabey (which does not really exist) to make internal decisions, often subconsciously. What is it worth to speak to a loved one in “Jabey”?. It costs $5 to call that loved one. What’s a “Jabey” worth in US Dollars? The exchange rate between the “Jabey” and the US Dollar is constantly in flux, though we may fix some exchange rates. The constant flux is from the arrival of new information ( Io to In ) but also from changes in the way we think and feel ( changing of the Filtration Fn ). My goodness, this value concept even incorporates behavioural economics. This constant changing of the filtration function means that the value can change even if the information set is the same. This means we have to modify our equation to cater for this shifting filtration function. 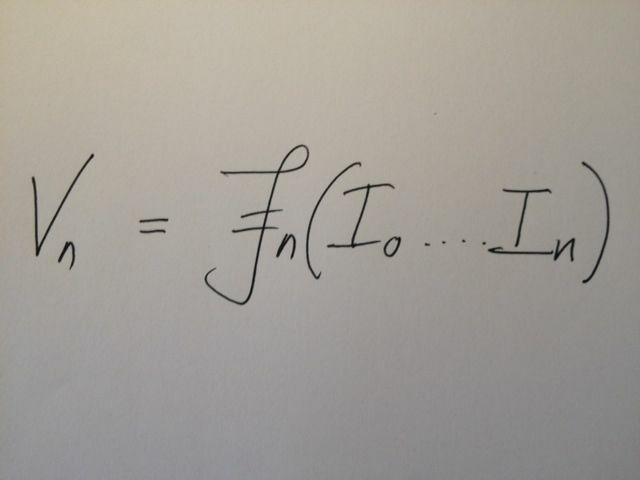 What is most glorious about this equation is that the filtration function co-evolves with information as it arrives. The purpose of Feature Injection is to spot information that should change the filtration function… but doesn’t. The great thing about this formula is that it can be plugged into an infinitely complex network. Inefficiencies in the network will be revealed as arbitrage opportunities. So tell me, can “purposeful” give you all of this richness? This entry was posted on Thursday, September 18th, 2014 at 1:05 pm	and posted in Uncategorized. You can follow any responses to this entry through the RSS 2.0 feed. « Cynefin and the Business Analyst / Product Owner.